"We envision the Omaeqnomenewak (People of the Wild Rice) as a strong, healthy and proud nation living in accordance with its culture and beliefs, and possessing the resources necessary to be successful in achieving our goals." Many tribal activities and services build on that vision. For example, there are ongoing efforts to preserve the Menominee language, including teaching the language directly to community members and certifying Language and Culture teachers. Education programs have integrated traditional tribal practices such as harvesting wild rice and maple syrup and gardening. Field trips take students into the forest and encourage them to use their senses, and greenhouses and orchards have been planted at schools to help link students with the food they eat and to strengthen their historic connection with the earth. Traditional cultural practices play a role in virtually every aspect of the Menominee trauma-informed initiative. The very premise underlying the approach – that individuals, problems and solutions are interconnected – reflects traditional values. 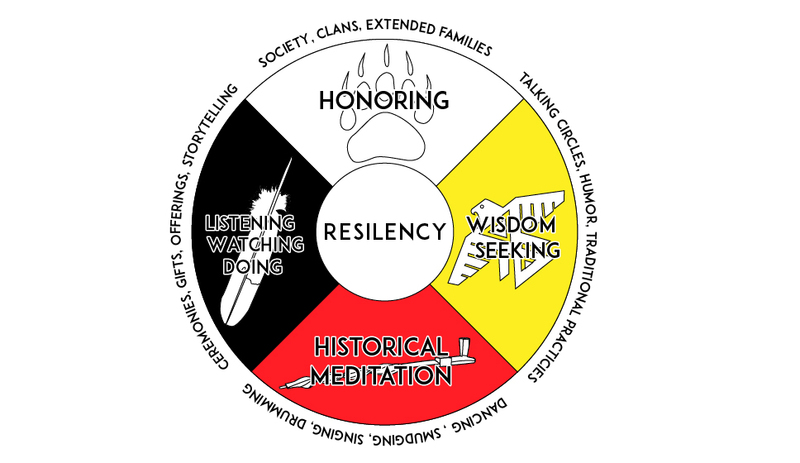 Significant efforts have been made to help people, both inside and outside of the tribe, to understand the historical trauma experienced by the Menominees and to recognize the role of traditional practices in healing and building resilience. Visual reminders of culture abound. 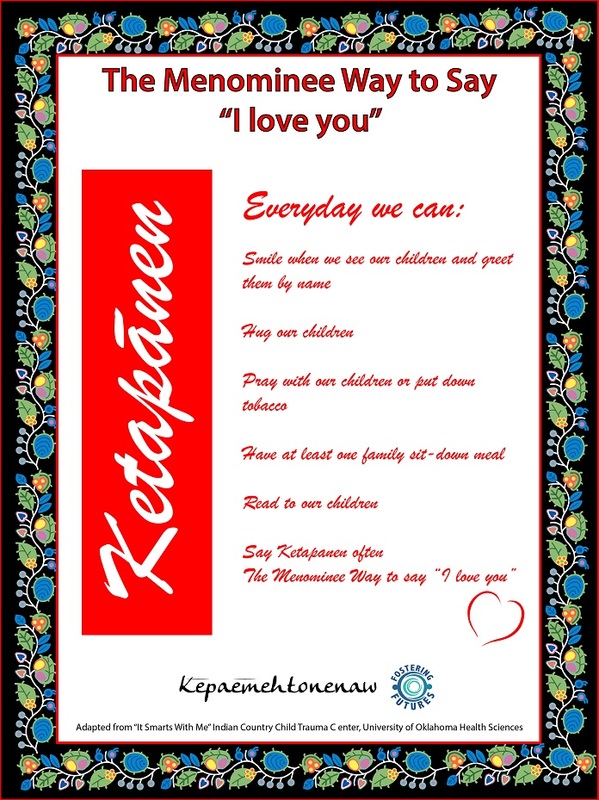 The slogan "Ketapanen – the Menominee Way of Saying I Love You" accompanies tips for trauma-informed parenting on bookmarks, posters, puzzles and refrigerator magnets, and a poster originally designed by high school students (shown below) includes important cultural images. Outcome data demonstrate that culturally relevant approaches work. In traditional Menominee culture, pregnancy is seen as a sacred state of being, and keeping women and babies safe and healthy is considered part of an honorable way of life. These values are affirmed by teaching high school students the Menominee Grandfather Teachings (wisdom, love, respect, bravery, honesty, humility and truth), and providing girls with culturally-relevant reproductive health and support services. Since these efforts were undertaken, annual births among girls aged 15-17 have dropped from a high of 20 in 2008 to fewer than 5. Similarly, a local coalition called Maehnow Pematesen, which means "living in a good way," has worked to reinforce traditional values among youth and to establish drug-free cultural events such as an annual sobriety powwow. Over the past decade, rates of substance abuse among high school students have declined, including use of marijuana (30%), cigarettes (49%), and alcohol (64%). We have put together four (4) videos to be viewed by our new employees or anyone who desires more information on the impact of historical trauma. The videos can be used as an introduction to the Menominee Nation. They will get you acquainted with our community and help you understand, not only what Menominee people have been through, but what all indigenous people on this continent have been through. The first video to see in this series is called "The Ancient Ones" by Discover Media Works. This video will be viewed at your place of work. "The Ancient Ones" does a nice historical overview of Menominee people along with current information on how our community functions today. You will need to check out this video from the Menominee Tribal Clinic Administration Department. Ask for Diane at the front desk. The second video to see in the series is called "Journey of Forgiveness" by the White Bison Organization. This video is a documentation of the White Bison Organization’s journey across the country visiting Indian Boarding Schools and allowing survivors of the Boarding Schools to tell their stories about their experiences while attending these Boarding Schools. There were many Federal Policies that helped contribute to Historical Trauma, in the quest for land in this country. One of the later Federal Policies established in the 1800’s that went right up to the 1940’s and 50’s was the Boarding School Policy on Education for Native Children. It was a Federal Policy to "assimilate" Indian people by taking the children away from their families and communities and putting them in militaristic federal boarding schools, hundreds of miles from their Reservations. This video will give you a good understanding of what we mean by Historical Trauma. To this day we are still recovering from that Boarding School Era and the ripple effect it has had on our families. The ripple effect of the breakdown of our family unit, of people getting raised not by choice, in these educational institutions and not getting parented by their own families or raised in their own tribal culture and traditions. The behaviors that you may see or experience in terms of substance abuse, neglect and abuse, anger, panic and anxiety, and other health and social issues are a direct result from the Boarding School Era. The third video in the series is called "Menominee Historical Trauma". We were inspired by the "Journey of Forgiveness" video to do our own video and interview some of our last remaining elders who went through the Boarding Schools. So under the Fostering Futures initiative, we created this video to focus in on the Menominee experience to Boarding Schools from around the 1930’s and 40’s. The video is 1 hour 13 minutes in length with an introduction by Regina "Gina" Washinawatok. The fourth video in the series is the Robert Wood Johnson video. In 2014-15, The Menominee Nation won the Culture of Health Prize from the Robert Wood Johnson Foundation for the effort we are making in our journey toward better health in our community. It was an honor to be recognized for these efforts. We have you see this video to share with you some of this work. Fostering Futures is a Wisconsin state program aimed to improve the lives of WI children and families by putting into practice the knowledge gained from the Adverse Childhood Experiences (ACES) study and the literature on long-term effects of chronic trauma in childhood. 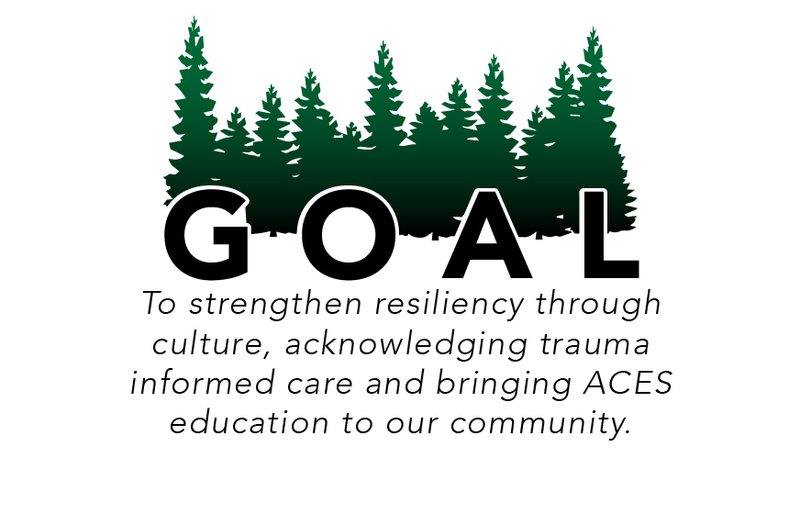 With the longterm goal of improving the health of families and children in WI we will integrate ACES, the benefits of resiliency and trauma informed care into systems that impact WI children and families. 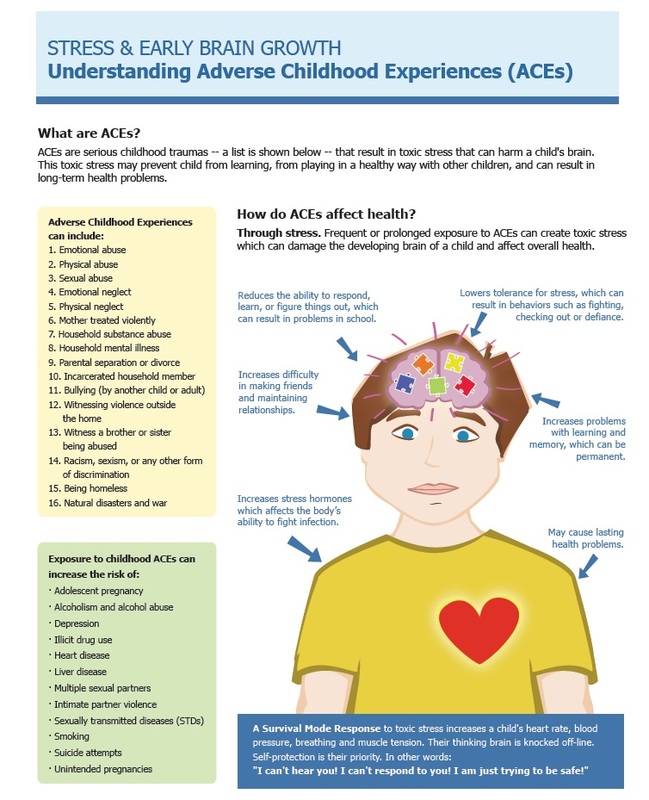 What are ACES (Adverse Childhood Experiences)? What should I learn about ACES (Adverse Childhood Experiences)? Positive self esteem, coping skills, and motivation created through connections with others in your personal life and in your community. Resiliency is the ability to move from being a victim to a survivor and eventually becoming a thriver. The Menominee Tribe and Menominee County have been dedicated to becoming trauma informed. Much of this work started with our work with Fostering Futures and has continued to grow and spread throughout our community. We have developed a 2 hour training entitled "Introduction to Trauma Informed Care." This training includes discussion on the following topics: Historical Trauma, Brain Development, Adverse Childhood Experiences, Secondary Trauma, Resiliency, Principles of Trauma Informed Care, and Community Trauma Informed work. To date 430 people have received this training. Agencies trained in the last year include: Eagle’s Nest Homeless Shelter, Youth Development and Outreach, College of the Menominee Nation, Menominee Transit, Human Resources, Menominee Tribal Social Services, Child Support, Menominee County Human Services, UW-Extension, Aging, Maehnowesekiyah Wellness Center (AODA and DV services), Menominee Tribal Police Department, Menominee Tribal Courts, and MISD. We also provide the ACE Interface training in our community. We had 2 employees complete the ACE Master Training in 2015; they have spread the word of ACE’s to 240 people in our area. In October 2016 we had 2 additional employees complete the Master Trainer curriculum and look forward to further helping the state get the word out about ACE’s. Quarterly, both the Introduction to TIC and ACE Interface are held at the Community Resource Center for community members to attend. We have been dedicated to training evaluations and reviewing data gathered at the completion of the trainings. We have used the data to evolve the trainings to be increasingly beneficial to the participants. We are exploring ways to compile data on the TI work occurring in the community. We would like to determine how agencies are using the TIC education they received and document what changes have been made because of the education. The Fostering Futures group completed the production of a Historical Trauma Video. This speaks specifically of the historical trauma experienced by the Menominee people. We will be using this video to train new employees to help them better understand the population they will be serving and to sustain our TIC efforts over time. Menominee is being recognized by our federal government as well as the state government. August 17, 2016 US Senator Heidi Heitkamp conducted a field hearing of the US Senate Committee on Indian Affairs and the Council on Native American Trauma-informed Initiatives, in Bismarck, North Dakota. A round table discussion on trauma in Indian Country was held. The Menominee Tribe was asked to give testimony on this issue and Senator Heitkamp touted Menominee as a poster Tribe and leader in all their efforts to address Trauma in Indian Country. MISD continues to be a leader in the trauma efforts. In September 2015 the district opened the Student Health Center to address the unmet mental health needs of the student body. Counselors from 3 local agencies (Menominee Tribal Clinic, Menominee County Human Services, and Maehnowesekiyah Wellness Center) staff the health center. The last academic year, there were over 400 appointment/student encounters. The district and the Head Start program have shown their dedication to being trauma informed by bringing the Head Start Trauma Smart curriculum to the community. This is a 10 module curriculum from the Crittenton Children’s Center in Missouri. This model was designed to help communities heal from traumatic events and build resilience. The Head Start, Pre-K, Kindergarten and 1st grade staff attended the 2015-16 academic year. The rest of the Keshena Primary School staff is currently attending the 2016-17 academic year. The College of the Menominee Nation has also been very supportive of the trauma work. Along with training their staff, they have put trauma and ACE’s education into the Elementary Education, Early Childhood Education and Nursing curriculums. MTC has just completed their affiliation with the Pediatric Integrated Care Collaborative. This is a program supported by SAMSHA and Johns Hopkins University that works to identify and treat trauma related problems. The clinic has started screening families with babies and young children for trauma using the SEEK (Safe Environment for Every Kid from the University of Maryland School of Medicine) Screen. The clinic maintains a close partnership with MISD providing both dental and behavioral health services in school for the students. There is work to implement optical services in the future. MTC continues to be committed to work toward a solution to the AODA issues being experienced in our community. We have worked to offer auxiliary services as alternatives to opioid prescriptions. These include physical therapy, chiropractic services, massage therapy, exercise therapy, and acupuncture. According to reporting done by the WI Prescription Drug Monitoring Program, Menominee County has had a decrease of 25.5% in opioid prescriptions. MTC is currently participating in the "National Cooperative Agreement on Clinical Workforce Development" with the Weitzman Institute to start a Post-Graduate Psychology Residency Program. The clinic’s current expansion significantly increases the area for Behavioral Health Services. We hope to house 2 pre-doctoral interns and 2 post-doctoral residents. Rotations for these interns and residents would include the MTC medical department, the Student Health Center and the Menominee Tribal Jail. The interns and residents will focus on Trauma Intervention and Native and Rural Health. The clinic currently has all staff participating in continuous trauma training. They have developed a 26 module (1 year) training for staff. Every 2 weeks videos or articles are send to staff for review. 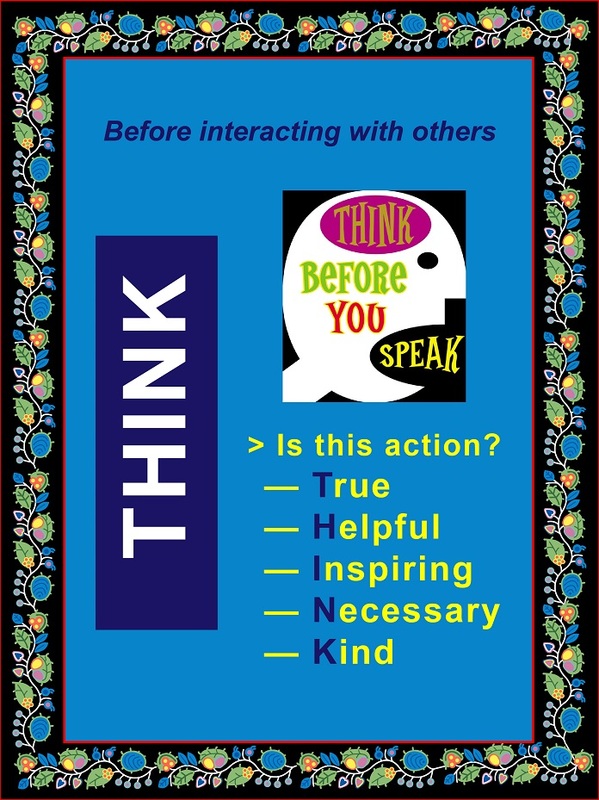 This provides an ongoing reminder of the trauma principles and works to remind staff to provide services in a trauma sensitive way. MCHS is committed to being trauma informed. They have implemented a trauma history that is a part of all assessments. They are in the process of reviewing all policies, procedures, and forms to be trauma sensitive. They have adjusted fee scales to accommodate more clients. They oversee area emergency services along with providing counseling and mental health case management. In 2016 the staff was trained in "Alternative Response" which aims to reduce out of home placements and facilitate cooperative, coordinated work with families to establish healing relationships. MCHS is an active participant in Fostering Futures, ACE’s education, the Student Health Center and community engagement. They, along with Maehnowesekiyah Wellness Center, continue to explore options to better service youth in the area struggling with AODA and mental health issues. Fostering Futures continues to meet as a core team and an advisory group quarterly. We also participate in The Community Engagement Workgroup. This is a way to keep other agencies and the entire community updated on our trauma work. We have been fortunate to have many agencies and citizens support and validate our work. In 2016 we were able to purchase resiliency supplies for MTC, MCHS, and Menominee Tribal Social Services from "Resilience Trumps ACE’s." We feel it is important to have consistent messages throughout our small community. We used some funds to purchase books for Maehnowesekiyah Wellness Center to help their clients maintain sobriety. We also purchased books for MCHS for families in foster care and families wanting to develop a wellness recovery plan. Fostering Futures, along with Casey Family Programs, sponsored a community event featuring the speaker Mr. Jonathon Cloud. The event was "Understanding and Responding to Trauma Exposure." It was attended by 70 people and was very well received. We are in the beginning stages of developing a trauma focused website with the help of the Menominee Tribal IT Department. This website will be a source of TI education and will grow to include best trauma practices. Fostering Futures also writes and distributes a monthly newsletter to help spread the word of trauma and adversities. We continue to meet with and update our local governing bodies annually. This includes The Menominee Tribal Legislature, The Menominee County Board of Supervisors, and The Menominee Indian School District Board. We are thankful for their continued support for Trauma Informed Care. Children are not born with resilience, which is produced through the interaction of biological systems and protective factors in the social environment. 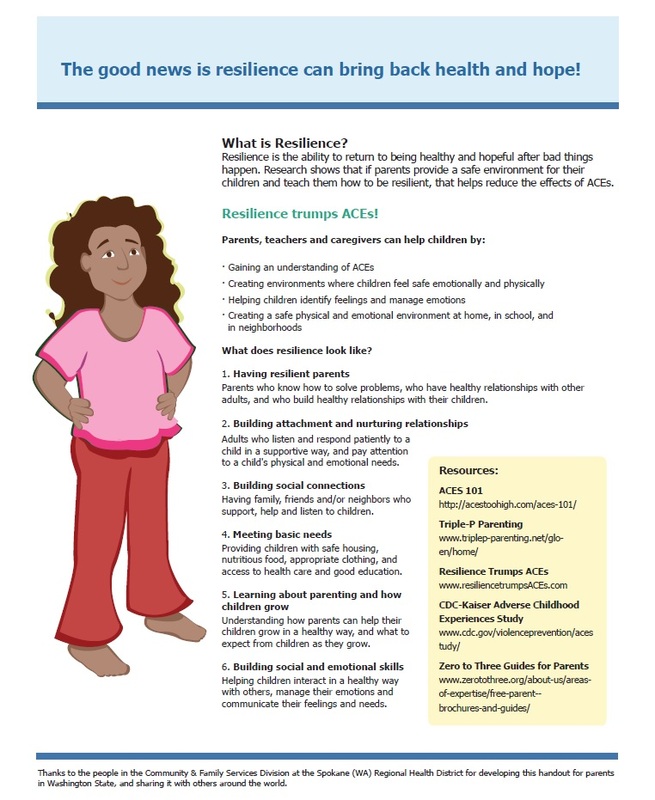 The active ingredients in building resilience are supportive relationships with parents, coaches, teachers, caregivers, and other adults in the community. Watch this video to learn how responsive exchanges with adults help children build the skills they need to manage. This video shows you what does the word resilience mean, and how can you base the aspect of resilience in your life. Trauma-informed care (TIC) is an intervention and organizational approach that focuses on how trauma may affect an individuals's life and his or her response to behavioral health services from prevention through treatment. Trauma refers to extreme stress that overwhelms a person's ability to cope. Russell Wilson, an ACEsConnection.com member from New Zealand, posted a question to the community in which he noted that a "heck of a lot of people" with ACEs who enter treatment are often never asked about those histories, and that this approach is not honoring their right to appropriate and adequate treatment. Vicarious Trauma: is about exposure to the emotionally disturbing images of suffering and horror characteristic of serious traumas. Remember...the interpretation of what each person deems to be traumatic is different. What is vicarious trauma, and how can it affect you in the work you do? This video introduces what we know about vicarious trauma, the possible effects and discusses techniques for addressing it. A number of researchers believe that child traumatic stress can sometimes be mistaken for ADHD because of the overlap between ADHD symptoms and the effects of experiencing trauma.